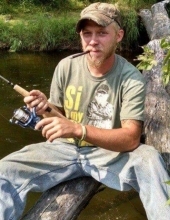 Wayne Allen Milliron, age 28, of Sugar Camp, died on Sunday, April 7, 2019 in Harrison. He was born on April 5, 1991 in Robbinsdale, MN to William and Jeralyn(Sorgatz)Milliron. Wayne moved to Rhinelander at a very young age and attended schools in Rhinelander, graduating from Rhinelander High School in 2009. After high school Wayne was first employed in the oil fields of North Dakota, he was then hired by the Ford Motor Company in St. Paul, MN. At the time of his death he worked as a directional driller all over Northern Wisconsin. Wayne enjoyed hunting, fishing and everything outdoors. He loved to bear hunt with hounds and was especially proud of his approval for a guiding license. Wayne also loved spending time with family and friends. He was a generous person that touched many people’s lives over his 28 years. He was the kind of person that would give you the shirt off his back if you needed it and was always respectful to everyone. Wayne was survived by his parents, grandparents Herman and Jan Sorgatz of Rhinelander, William Milliron Sr. of Florida, godmother Kay Milliron of Minnesota, other family and many friends. He was preceded in death by his grandmother Shirley Milliron, and godfather George Milliron. A visitation for Wayne will be held on Friday, April 12 from 4-7 PM at the Carlson Funeral Home with a memorial service to be held on Saturday, April 13 at the Carlson Funeral Home at 11:00 AM. You may leave your private condolences for Wayne at www.carlsonfh.com. The Carlson Funeral Home(715)369-1414 is handling the arrangements for the Milliron family. "Email Address" would like to share the life celebration of Wayne Allen Milliron. Click on the "link" to go to share a favorite memory or leave a condolence message for the family.